Testicular ischemia and segmental infarction are rare complications of acute epididymitis. Accurate diagnosis is essential for instituting proper treatment. Doppler ultrasound is an efficient modality for assessing the serial changes in the vascularity of the testis. Lack of symptomatic improvement is a clear justification for perfoming repeat Doppler ultrasound in acute epididymitis. A 31 year old patient presented to the emergency department with acute scrotal pain, swelling, dysuria and fever. On examination, he had a tender swelling of the right testis with preservation of cremasteric reflex. Laboratory studies were normal except for mild elevation of WBC count. Doppler ultrasound of the scrotum revealed an enlarged epididymis with increased vascularity and minimal peritesticular fluid, consistent with acute epididymitis. The testis showed normal echotexture and vascularity (Figs. 1a, b). The patient was discharged with antibiotic and analgesics. Figure 1: (a) Initial Doppler ultrasound shows minimal peritesticular fluid (arrow head). (b) Enlarged right epididymis with increased vascularity denoting acute epididymitis (white arrow) and testis showing normal vascularity (black arrow). Figure 2: (a) Absent testicular flow suggestive of testicular ischemia (white arrow). (b) Hypervasular epididymis (black arrow). 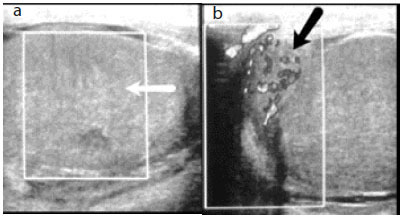 Figure 3: (a) Partially regained perfusion of the testis (black arrow). (b) Irregular hypoechoic area in the upper pole of testis suggestive of segmental infarction (white arrow). The patient was admitted and treated conservatively. On tenth day of hospital stay, he developed a tender fluctuant swelling in the right testis with associated fever and chills. Repeat Doppler ultrasound revealed an avascular hypoechoic area measuring 3x 1.8 cm in the upper pole of the testis with regained perfusion in the other parts of the testis, (Fig. 3 a, b). Immediate orchidectomy was performed and histopathological examination confirmed segmental infarction of the testis with necrosis. Torsion was excluded in this case by demonstration of testicular flow in the initial scan itself. Peculiar clinical course and findings in repeat Doppler also ruled out the possibility of detorsion. This case is reported to illustrate a rare complication of acute epididymitis and to highlight the importance performing follow up Doppler ultrasound, especially when the symptoms persist in spite of treatment. Drotman DP. Epidemiology and treatment of epididymitis. Rev Infect Dis 1984; 4:788. Mittemeyer BT, Lennox KW, Borski AA. Epididymitis: a review of 610 cases. J Urol March 1966; 95(3):390-392. Costa M, Calleja R, Ball RY, Burgess N. Segmental testicular infarction. BJU Int March 1999; 83(4):525. Bird K, Rosenfield AT. Testicular infarction secondary to acute inflammatory disease: demonstration by B-scan ultrasound. Radiology September 1984; 152(3):785-788. Renckien RK, Du Plesis DJ, De Haas LS. Venous infarction of the testis-a cause of non-response to conservative therapy in epididymolorchitis. S Afr Med 1990; 78:337-338. Gofrit ON, Rund D, Shapiro A, Pappo O, Landau EH, Pode D. Segmental testicular infarction due to sickle cell disease. J Urol September 1998; 160(3 Pt 1):835-836. Baer HM, Gerber WL, Kendall AR, Locke JL, Putong PB. Segmental infarct of the testis due to hypersensitivity angiitis. J Urol July 1989; 142(1):125-127. Nussbaum Blask AR, Rushton HG. 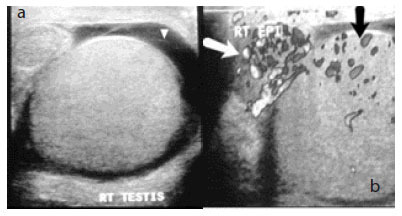 Sonographic appearance of the epididymis in pediatric testicular torsion. AJR Am J Roentgenol December 2006; 187(6):1627-1635.